New commercial-free streaming service Britbox launches in the U.S. today. For years, fans of British television who live in the United States have been starved of some of the UK's most popular shows—such as Cold Blood, Casualty, EastEnders, and Emmerdale—at least, via mainstream video streaming services like Netflix and Hulu. But that all changes today with the launch of Britbox, a $6.99-a-month online streaming service from BBC Worldwide and ITV that will debut "thousands of hours" of new British programming on this side of the Atlantic. Amongst the lineup, which includes longrunning soaps, period dramas—like the pre-Raphaelite Desperate Romantics, the 2010 reboot of the iconic 1970s series Upstairs Downstairs, and the classic mini-series Brideshead Revisited—and documentaries, are plenty of food and cooking shows that were previously unavailable Stateside. Strongly recommended for your Britbox food-watch list: Nigella Lawson's Nigellissima, full of good Italian home-cooking with a British twist; Rachel Khoo's Kitchen Notebook: London, which explores the British capital through a series of easy recipes; and Hairy Bikers Everyday Gourmets and Bakeation, where David Myers and Simon King cook (and bake) up feast-worthy dishes. 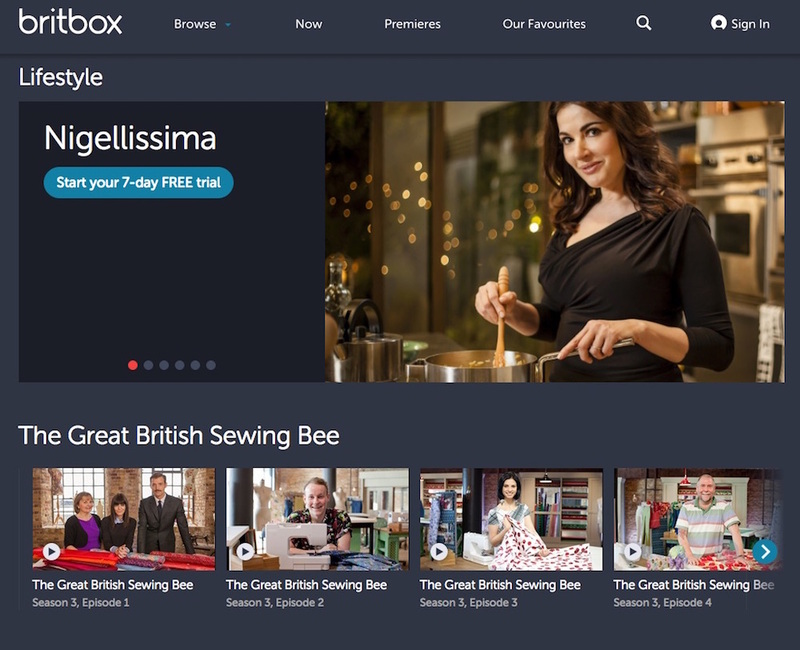 Britbox streams British shows commercial-free in the United States. What's even more exciting than legacy BBC and ITV hit shows? Many current season shows on Britbox will be available to U.S. audiences 24 hours after new episodes air in the U.K..
"BBC and ITV are known for a vast array of diverse and award-winning programming that fans in the U.S. love and want to watch," Britbox President Soumya Sriraman said in a statement. "Those fans now have a one-of-a-kind SVOD [streaming video-on-demand] service option that offers a single point of access to an extensive collection of outstanding British programming to discover and enjoy." Launching today, Britbox is available online, Apple TV, iOS, and Android for a free seven-day trial, after which monthly subscriptions are priced at $6.99.